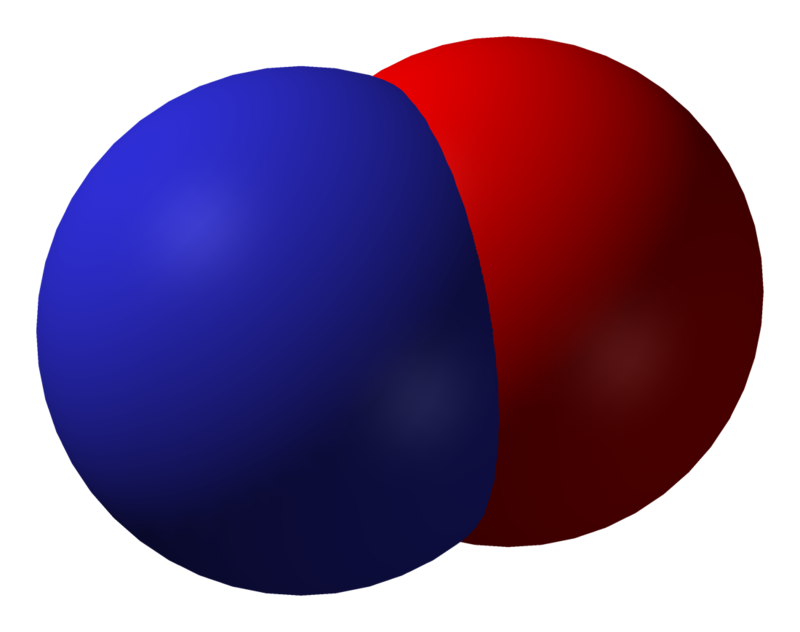 Nitric oxide is a very simple molecule consisting of one atom each of oxygen and nitrogen. It should not be confused with nitrous oxide which is made up of two nitrogen atoms and is commonly known as laughing gas – once a common anaesthetic. Outside of the body it often occurs as a pollutant with the potential for causing illness. Much of this pollution comes from car exhaust. Because it is a small and simple molecule, nitric oxide is particularly suited to its function as a chemical messenger both between cells and within cells, easily passing through cell membranes. Its chemical structure also includes a double bond, this makes it a reactive compound, which means it reacts with other chemicals easily and breaks down quickly. This is a further attribute of a good chemical messenger in that it can quickly be got rid of. However, it is this reactivity that makes nitric oxide a pollutant in the environment. There is a great deal of research currently being carried out on the many roles of nitric oxide. Sometimes these roles seem contradictory for example in the case of apoptosis – cell death, with nitric oxide sometimes promoting the process and at other times inhibiting it. Two major areas of physiological function have emerged as having a particular reliance on nitric oxide. These areas are control of blood vessel action and immune function. The walls of blood vessels incorporate a thin layer of muscle. Like other muscles in the body this muscle can contract and relax in response to signals from chemical messengers. Key among these is nitric acid which causes the muscle to relax and therefore dilates the blood vessel to allow more blood to flow. This is important to maintain adequate glucose and oxygen supply to various tissues and organs and to regulate blood pressure. This function of nitric acid has therapeutic value. The nitrite drugs such as glyceryl trinitrite are used to treat angina. This drug is converted to nitric oxide in the body which in turn relaxes the blood vessels supplying the heart and thus eases the pain. Phagocytes are white cells which are central to immune function. They ingest bacteria and destroy them. Phagocytes can produce nitric oxide which is toxic to bacteria. An unfortunate side-effect of this is damage to the body's own cells as well. This is the one of the reasons that inflammation – an integral part of the immune response – is so painful: there is quite a bit of cell damage going on, our own and bacteria. The reactivity of nitric oxide comes in here. Because it's so toxic to all cells it needs to be produced quickly when needed and rapidly destroyed when its job is done. The body has a number of control systems that regulate the switching on and off of toxic but necessary substances like nitric oxide. Because of the central role of nitric oxide in inflammation research has looked at the possibility of using exhaled nitric acid gas as a marker for inflammation in certain conditions such as asthma, atherosclerosis and rheumatoid arthritis. This article is for information only. If you have any health concerns you should consult your doctor.